Single-pole thermostat SPDT, mm 1500 inox steel capillary, -35+35°C. Suitable for automatic adjustment of refrigeration system. Single-pole thermostat SPDT, mm 1500 copper capillary, 0/40°C. Suitable for automatic adjustment of cooling system. 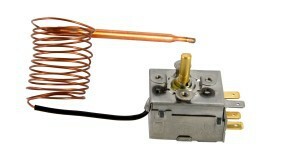 Single-pole thermostat SPDT, mm 1500 copper capillary, 0/60°C. Suitable for automatic adjustment of cooling system. 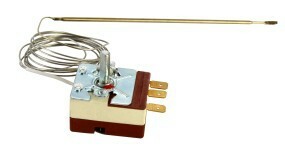 Single-pole thermostat SPDT, mm 1500 copper capillary, 0/90°C. Suitable for automatic adjustment of heating system. Single-pole thermostat SPDT, mm 1500 copper capillary, 30/120°C. Suitable for automatic adjustment of heating system. 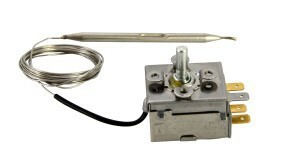 Single-pole thermostat SPDT, mm 1500 inox capillary, 0/220°C. Suitable for automatic adjustment of burners and ovens. Single-pole thermostat SPDT, stainless steel capillary 1500mm, 50/315°C. Suitable for automatic adjustment of ovens and similars.